Donut Dash is the ultimate display of endurance, speed, and hilarity. This unique fun run brings together the greater Pittsburgh community to benefit an amazing cause. All proceeds from Donut Dash support the Mario Lemieux Foundation's Austin's Playroom Initiative. Competitive runners run one mile, eat six donuts, and then run another mile. 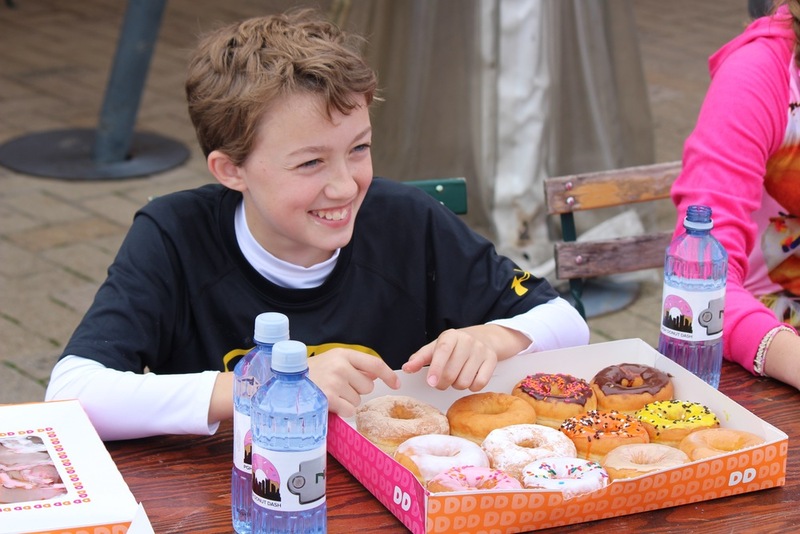 Casual runners can enjoy the course and donuts at their leisure. Donut Dash 2018 was a huge success. We had an incredible time celebrating 10 years of Donut Dash and we hope you did too! We are happy to announce that in the first year of our partnership with the Mario Lemieux Foundation, we were able to raise over $77,000 for the Austin’s Playrooms Initiative. We are already looking forward to next year’s event, and we hope to see all of you there! Looking for your times? Check out the timing portal. Donut Dash 2017: A record-breaking success. Donut Dash 2017 was even more incredible than we could've imagined. In the year of Alumni Advisor and inspiration Bob Dax's passing, we saw over 1,400 participants and were able to raise over $200,000 in his honor. Thank you to each and every participant that helped us break our goal and exceed our $500,000 commitment to the Live Like Lou Center for ALS Research a whole year early. With your help, we also broke our own record for the largest amount of money raised by an individual greek organization. We had a blast, and we hope all you did as well! Donut Dash 2016: A record-smashing year for donuts and dashing. Donut Dash 2016 was an incredible year. We raised more money than ever before for the Live Like Lou Center for ALS Research. We raised $176,000 in honor of our hero, Alumni Advisor Bob Dax. This is more than any individual greek organization has ever raised before! We saw more participants than ever and the tons of fun that was had. After what started as a rainy day, we saw the sun and smiles come out! We had an exclusive Donut Dash backdrop where runners could take pictures to show off their donut enthusiasm! We had the Mayor of Pittsburgh in attendance, the President and Provost of Carnegie Mellon, the Chancellor of the University of Pittsburgh. It was a blast! Donut Dash 2015: Thousands of participants, thousands of donuts. 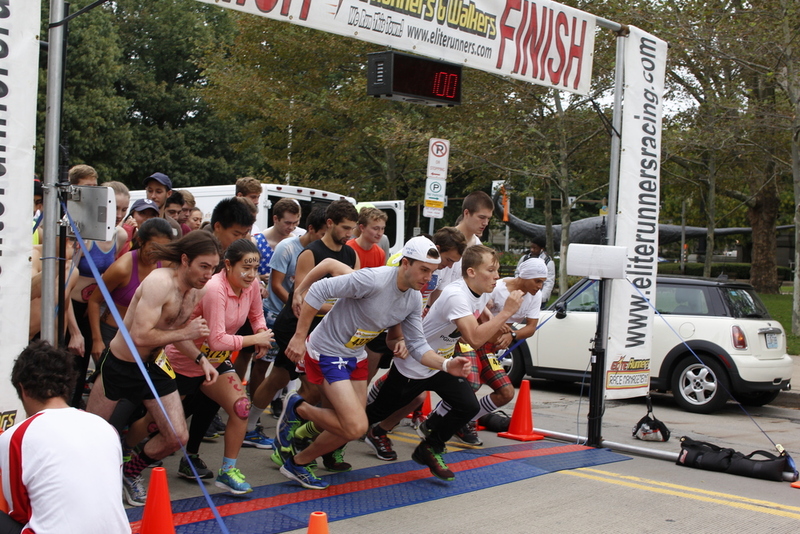 Donut Dash 2015 took place in Schenley Plaza in Oakland for the first time ever, and it was a huge success! The new route around the plaza and down to Phipps Conservatory was fresh and exciting. 2015 was the first year that we featured a donut eating competition, which was great fun for everyone! We had vendors such as Peace, Love, and Little Donuts, and featured a comfortable open area. We had more runners than ever before, which means more donuts than ever before. The beautiful weather contributed to the fun atmosphere that could be felt by everyone. Donut Dash 2014: 900 participants. 6,600 donuts. Endless fun. Centered at the Morewood Gardens parking lot on Carnegie Mellon's campus, featured a new route along Morewood and Forbes Avenues as well as live music, and eight vendors including Franktuary and Mac & Gold. Runners took a one mile path starting at the base of Morewood Gardens Apartments headed west, turned around at S. Craig Street, followed Forbes to Margaret Morrison, turned around again, and completed the loop by going behind Morewood Gardens to get their donuts. The second lap was the same as the first, except everyone was up to 6 donuts heavier! Donut Dash has four divisions: Competitive, team, casual, and family. Some of these divisions require the consumption of all six flavorful donuts and the completion of the full two mile race while others allow for more leisurely consumption and less cardiovascular strain. The home page of the Pittsburgh Donut Dash! Donut Dash 2018 is on Sunday, October 7st! Sign Up or Donate Online Here!